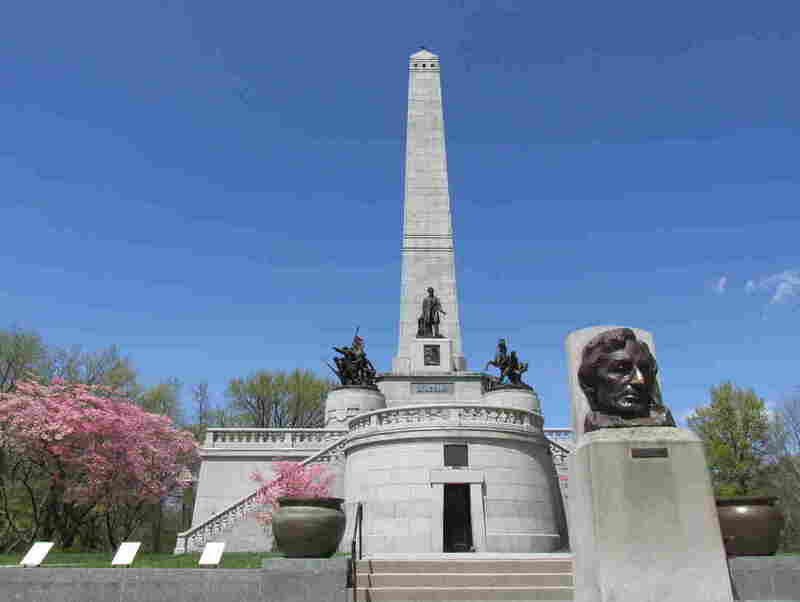 Lincoln's Tomb Site At Risk With State Budget Cuts Thousands will honor Lincoln's death in Springfield, Ill. this weekend. Yet, the tomb's caretakers are facing criticism from scholars and are struggling to find funding to maintain the historic site. The Lincoln Monument at Oak Ridge Cemetery in Springfield, Ill., houses the tomb of the late president and was erected to preserve his legacy. Tens of thousands of people are expected to gather in Springfield, Ill., this weekend to watch a recreated hearse commemorate Abraham Lincoln's funeral procession, which took place 150 years ago. Adam Goodheart, who's written extensively about the Civil War, has visited Springfield a number of times. "I find it a very powerful place," he says. "I'm very moved by many of the monuments to Lincoln there, including Lincoln's own house." National Geographic sent Goodheart on the same journey that was Lincoln's last — the train route that took his body from Washington to Springfield. Along the way, those many decades ago, hundreds of thousands of people viewed his body. Goodheart says he was especially moved by an exhibit at the Abraham Lincoln Presidential Library and Museum. "They actually have bits of fabric that are stained with his blood, some of the dried flowers that were placed on his coffin during the funeral, and seeing those relics really just seemed to compress those 150 years since his death and make it very immediate," he says. 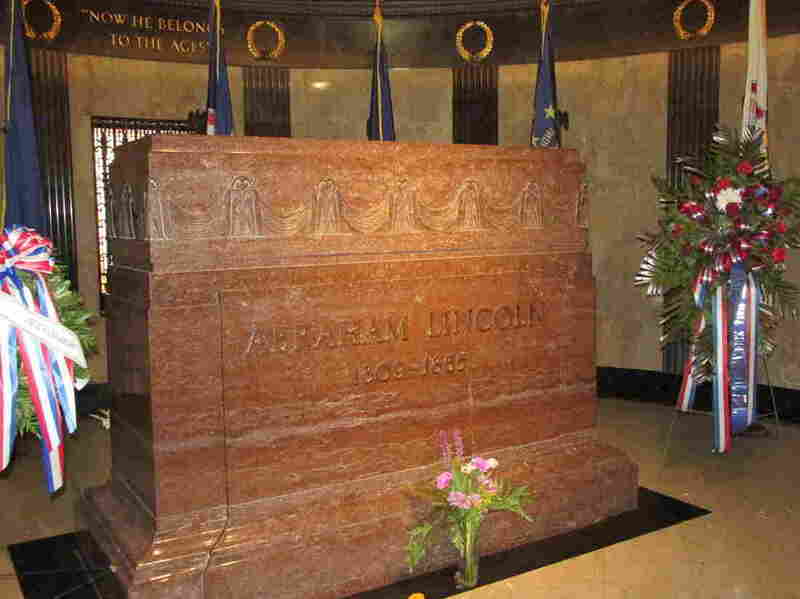 But that wasn't the case at Lincoln's tomb, located in the middle of the large Oak Ridge Cemetery on the outskirts of town. He calls the tomb a "disappointment," saying it lacks charm. "There's one pretty startling omission," Goodheart says, "which is that it doesn't mention the Emancipation Proclamation or Lincoln's role in liberating African-Americans from slavery." The Illinois Historic Preservation Agency, which oversees management of the tomb, has had their funding cut in half to save state money. Chris Wills works for the Illinois Historic Preservation Agency, which oversees management of the tomb. Over the past 15 years, his agency's budget has been slashed in half, due to Illinois' large budget gap. "That's created a huge squeeze that the state is now having to deal with," Wills says. "One of that ways that's been dealt with over the years is to cut back on funds at the Historic Preservation Agency." Those cuts have led to staff layoffs and less access to historic sites. Pam VanAlstine heads the Lincoln Monument Association, a private foundation helping fill some of those budget gaps. But her group has only about 20 volunteers. One volunteer, Ruth McCarty, has just finished her last tour of the day. She's standing in the tomb's marble-covered entrance. A bronze statue of Lincoln is in the middle, below a tarnished metal ceiling. "We've already had people from Thailand here today, and Mexico, and Ireland," McCarty says. "It's just amazing how far people will travel." The state's new governor, Bruce Rauner, wants to dissolve the state's Historic Preservation Agency to save money. At the state Capitol, Pam VanAlstine is about to lobby legislators against a move that she says would make keeping the tomb open to the public even more problematic. "I am so worried about the preservation part," she says. "Will we be able to keep these sites open? Will we be able to preserve their history? That's my concern." So, while Springfield prepares for the somber commemoration of Lincoln's sad, final journey, questions linger over whether his final resting place will be well cared for and open to the public, for generations to come.